I don't know about you, but when I think of Indian food it's usually in a fast way. It's convenience food, right? Something you either pick up or have delivered when you don't feel like cooking. Not that there's anything wrong with that. I've got some great Indian places near me like Palki and Vijay, that I visit or order from pretty regularly. But eating lunch at Trishna in Marylebone recently has changed the way I view Indian food and for the better. Trishna has been on my radar for a while, partly because it was awarded a Michelin star in September 2012, but also because it has a reputation for modest pricing. London has its fair share of high-end Indian restaurants like the Cinnamon Club and Rasoi, but I generally balk at paying up to £30 for a main unless I'm out to celebrate. For less than that, £22.50 to be precise, you can get a three course meal from the 'lunch bites' or 'early evening' menus at Trishna which also comes with a choice of a side dish (spinach with corn or dal in my case) and rice or bread. Since there were two of us, Mr B and I split the options and tried both sides plus the bread and rice. 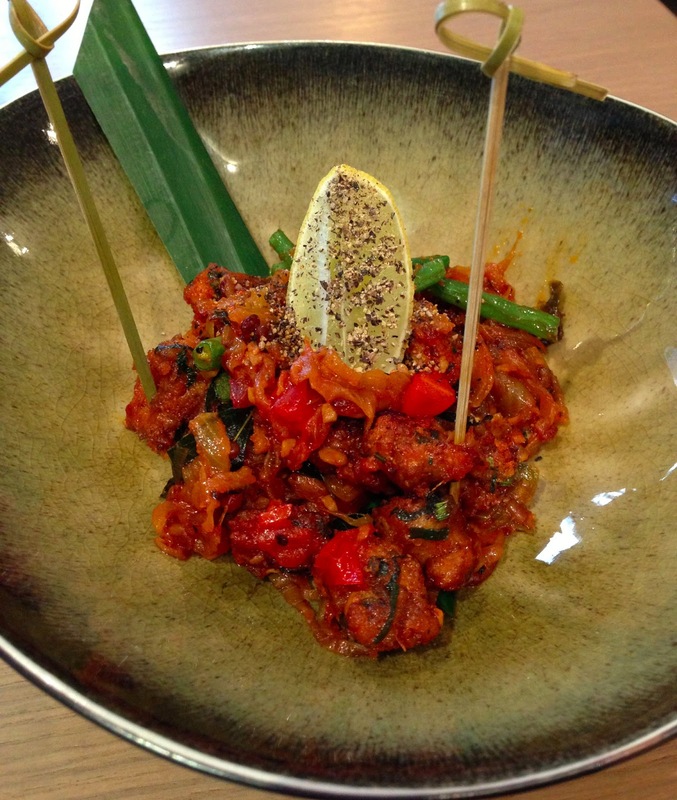 The starter of "quail pepper fry - keralen spices, black pepper, curry leaf" set the flavour bar high from the outset. The fried quails thighs were tender bite-sized morsels with complex spicing building up from deeply caramelised onions. Lingering heat came from loads of cracked pepper although this was countered by the tang and sweetness of the tomato. A smattering of green beans added textural crunch. 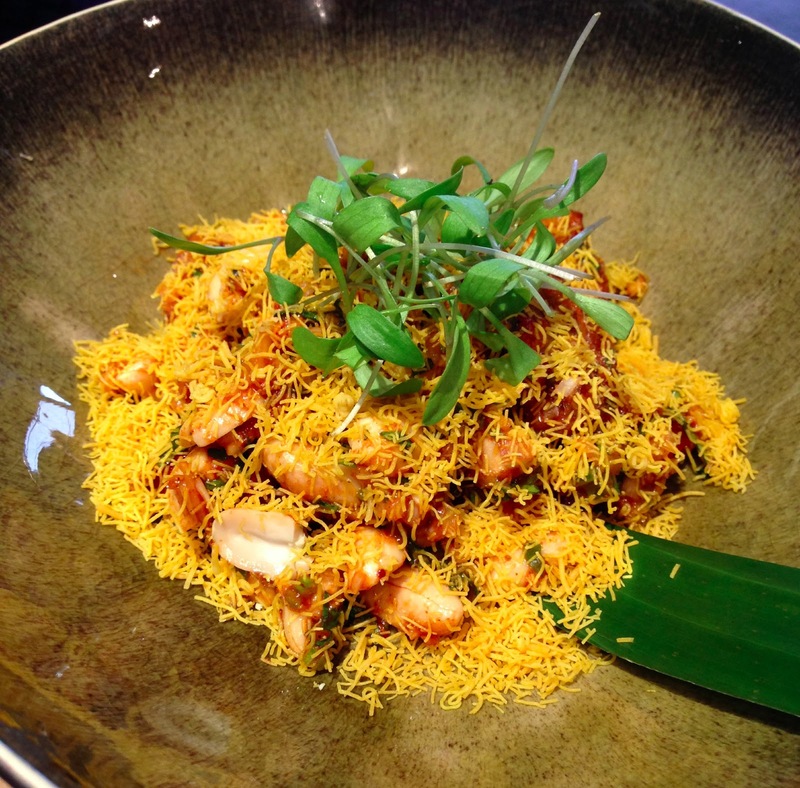 Mr B ordered the "Aubergine chat - peanuts, chat masala, coriander, tamarind, sev". The aubergines were a perfect vehicle for the heat from the green chilli, sweetness from the chat masala and crunch from the peanuts. The crispy yellow noodle-like coating you see in the picture below is sev, made from fried chick pea flour. I enjoyed this, but preferred the quail. Moving on to our main courses, the "Guinea Fowl Tikka - fennel seed, star anise, masoor lentils" was one of the best Indian dishes I've eaten. The bird was incredibly tender, and I loved the delicate spicing while the charring from the cooking added extra flavour. The lentils were slightly crunchy adding more texture. Although I'm all for innovative and interesting plating, the tikka unfortunately cooled pretty quickly on its wooden board. This dish would be better on a warmed plate, or perhaps I should just eat faster. Mr B's "Seafood Biryani - basmati rice, sea bass, shellfish, fresh herbs, cucumber raita" was all tender and juicy fresh seafood with the more restrained spicing of a biryani. The raita added a great zing to this dish. Special mention for the side dishes: spinach and corn, with the haunting warmth of cumin, and a Hyderabadi dal crowned with a fiery scotch bonnet. 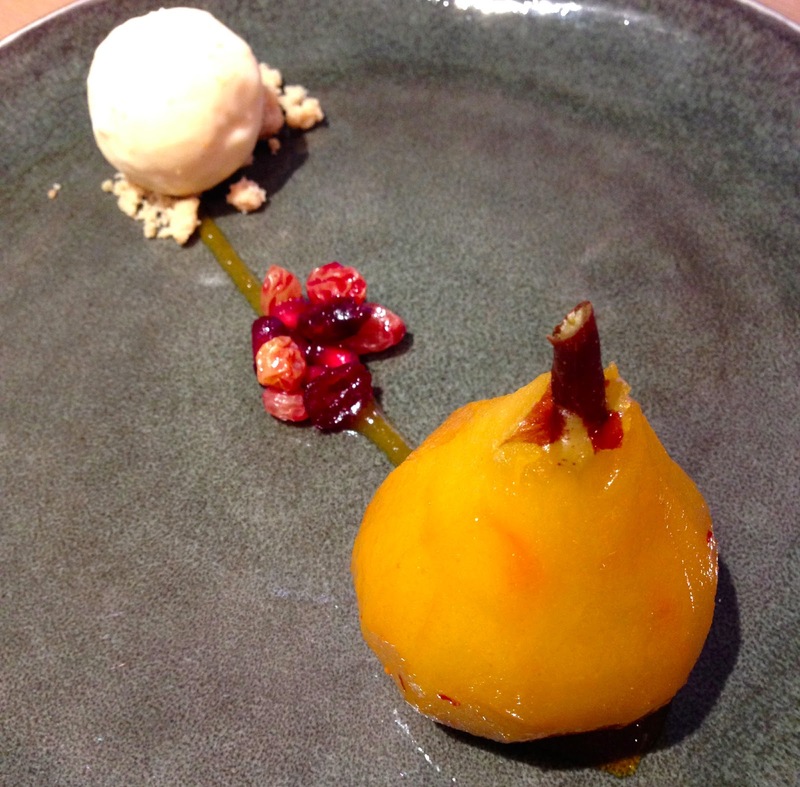 Desserts maintained a high standard, with a creamy cardamom Kheer (with fig, raisin, pistachio), although the Saffron & Honey Poached Pear was crunchier than I expected, and not from the unexpected stuffing of pistachio and chenna. I would have preferred a longer poach for this dish. The wine list looked pretty extensive and not too greedy on pricing either with wines by the glass in the £6-7 range (I enjoyed a decent glass of Gruner Veltiner) and plenty of bottles sub £40. There's also a good range of fruit cocktails. The lunch bill for two for three courses (plus a side dish each, bread and rice), a glass of wine and a fruit punch came to a slightly spooky £66.66 including service. I think that's fairly reasonable for the quality, and quantity, of food we had. The expert spicing was a revelation to my fairly uneducated Indian palate, which is more accustomed to everyday Indian. For the price, I don't think you can beat Trishna for a great introduction to more refined Indian food. You may even leave enlightened.